Eastern Part of The United States of America including all the Newly Acquired Territory. This is a large and beautifully detailed 1903 map of the eastern part of the United States by the Scarborough Company. This pocket map covers the United States East of Minnesota, Iowa, Missouri, Arkansas and Louisiana, including parts of Nebraska, Kansas, Oklahoma and Texas. 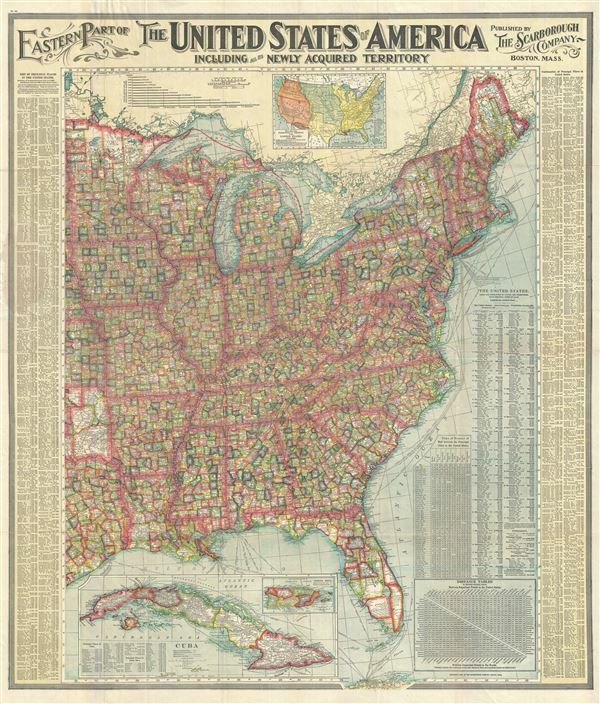 This incredibly detailed map notes countless towns, villages and cities throughout along with individually color coded counties in every state. Rivers, railroads, shipping lines, lakes (including the Great Lakes) mountains and a host of additional topographical features are also noted. The map is particularly interesting in its illustration of the newly acquired territories of the United States. A large inset of Cuba and another inset of Puerto Rico (Porto Rico) are included in the lower left quadrant of the map. As a result of the Spanish-American War of 1898, Spain would be forced to cede the Philippine Islands, Puerto Rico and Guam to the United States, as well as relinquish sovereignty over Cuba. Cuba would formally gain independence from the United States in 1902 just a few months prior to the printing of this map. Another inset showing the territorial growth of the United States from 1776 – 1902 is included under the title. An index of the principal places in the United States is features along the left and right borders of the map. A thematic graph shows the growth of population from 1790 to 1900. The bottom right quadrant features two tables, the first noting the time of transit of Mail between the principal cities and the second features a distance table between important points in the United States. Another index listing the area and population of states and territories, with principal cities of each, is also included. Dated and copyrighted to 1903, this map was published by the Scarborough Company, Boston, MA. Very good. Minor wear along original fold lines. Slight toning along right index, where map was attached to binder. Professionally flattened and backed with archival tissue.